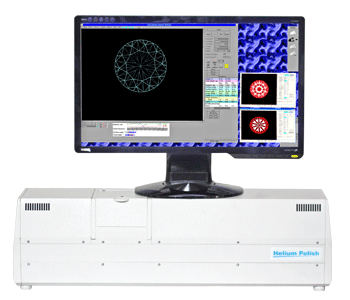 The Helium Polish diamond scanner is a modern device for cutting factories, laboratories and dealers. When a diamond is scanned with Helium an accurate 3D-model is constructed for the angle of inclination and the azimuth. This 3D model allows accurate visualization and realistic images to be produced that can show small distortions of symmetry and to use the output with various systems of appraisal. What is new in the Helium Polish 5.6 ? Make sure that you saved all previous files of Helium Polish program before downloading and installation of new program in store archive folder. In case of necessity you can use them. The program folder contains files HeliumBat.ini, HeliumDrivers.ini, HeliumStart.mmd and folders PriceList, Cuttings and Report, which are individual for each customer. Please contact to distributer of the program for editing them and getting correct versions of those files and folders. The program requires hasp HL pro keys. If you install Helium Polish 5.6 first time please also download and install the Hasp HL driver.